In this handout photo from Qatar News Agency, Sudanese President Omar al-Bashir, center left, meets with with Qatar's ruling emir, Sheikh Tamim bin Hamad Al Thani, in Doha Qatar, Jan. 23, 2019. Sudanese President Omar al-Bashir was in Qatar Wednesday to discuss aid for his embattled nation as the United States expressed concern over death, injuries and arrests of Sudanese citizens over four weeks of protests challenging Bashir's government. Meanwhile in Khartoum, Sudan's oil minister announced the country has accepted offers of aid from the UAE, Russia and Turkey. Oil Minister Azhari Abdel Qader announced that his country "accepted it as a normal matter between friendly countries in light of the current circumstances that Sudan is going through." He did not elaborate on how much aid was offered or when it would be delivered. 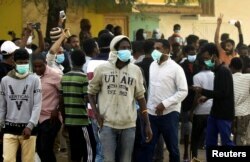 In a statement, a spokesman said the United States "supports the right of the Sudanese people to gather peaceably to voice their demands for political and economic reform and a more peaceful and inclusive Sudan." The statement added that the United States condemns the use of violence, including "the use of live fire, and the excessive use of tear gas" by the Sudanese security forces. Sudanese demonstrators gather as they participate in anti-government protests in Khartoum, Sudan, Jan. 17, 2019. It said a "new, more positive relationship between the United States and Sudan" requires "meaningful political reform and clear, sustained progress on respect for human rights." In addition to prohibition of arbitrary detention and excessive force against protesters, it said the government must end its "harassment and intimidation" of journalists, activists, and medical personnel. The State Department urged the release of those who have been arbitrarily detained and a credible and independent investigation into the deaths and injuries of protesters, as well as a "safe and secure environment" for public expression and dialogue. The country has seen large-scale demonstrations since December 19, when the government raised bread prices. The protests have grown in scope, and many are calling for an end to Bashir's three-decade-long rule. Bashir has tried to downplay the protests, maintaining that foreign "agents" and "infiltrators" are responsible for the dissent as well as the violence that has followed.